AVCHD (Advanced Video Coding High Definition) is a file-based format for the digital recording and playback of high-definition video, which is a new HD camcorder format and compressed by using the MPEG-4 AVC/H.264 standard without losing much in the way of quality. AVCHD has been designed to be compatible with Blu-ray Disc format and can be used for authoring and distribution of high definition video, though with reduced quality and interactivity compared to Blu-ray Disc. Now Any Video Converter Ultimate supports burning videos to AVCHD DVD. Please note that the output AVCHD DVD just can be played on Blu-ray Disc players or DVD Players which support AVCHD DVD. Here the following is a brief guide on how to burn video to AVCHD DVD. If you want to burn video to AVCHD DVD, please refer to this guide on how to burn video to DVD. Step 1 : Add video to the program. Go to "Burn DVD" window, then click Add Video(s) button. Press Ctrl or Shift to select more than one video at one time in file folder. Or click button in the upper right corner of the main window and choosing File > Batch Add Video Files to add video clips from single or multiple folders. After you add desired videos, all of them will be displayed on the middle panel with their detailed information, including duration, format and size, etc. Step 2 : Choose Burning to DVD output profile. Please unfold Output Profile, and then choose AVCHD 720P Movie(*.m2ts) or AVCHD DVD 1080P Movie(*.m2ts) under AVCHD DVD Movie profile according to your DVD Player. Step 3 : Click "Burn Now!" button to start encoding videos and burn videos to dvd. Once everything is ready, you can click on Burn Now! to start the exporting process. If you would like to pause encoding, please just click the button. If you would like to stop encoding, please just click the button. 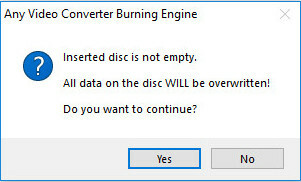 While the conversion has finished, it will automatically start burning converted videos to dvd. Note: If the inserted disc is not empty, you will be prompted to erase the disc. Click Yes, all data on the disc will be overwritten! During the process of burning, you can view burning information like DVD Size, Burn Time, Burn Status at the bottom of window. After the program finish to burn video to AVCHD DVD, it will pop up a Burning Engine to congratulate you that your disc has been successfully burned. Click OK button, the drive automatically ejects the disc. Now your video have been burned successfully to AVCHD DVD, just have fun! Please note that the output AVCHD DVD just can be played on Blu-ray Disc players or DVD Players which support AVCHD DVD.